If you’re currently in an SLP undergraduate or graduate program, Soundable is your new “Rosetta Stone®” for learning phonetics. I distinctly remember meeting in empty rooms with my undergrad friends taking turns yelling out words, then seeing who could phonetically spell it out the quickest. If only we had this app back then. Sure, you could practice workbooks or beg a friend to study for hours in the library – BORING! Read the rest of this review, download the app, go about your business, and let’s battle to the death playing Soundable!!! (or till we run out of tiles, details…details). Cost: Free – there is an in-app purchase option to remove ads if you get tired of them. This app is only available on iTunes at the moment. The best description of the game comes straight from the website, “It’s like Scrabble® for friends who can’t spell!”I’ve always been a terrible speller, which is why the normal Scrabble game makes me turn up my nose. Soundable takes away the spelling component and brings back those early phonics skills they’ve become automatic with reading. Since the developers are Tactus Therapy and LessonPix, the quality is excellent and you can tell they put forth great effort into making this game streamlined and easy to play. You start by selecting an opponent by looking up their username. Mine is “slp_echo” so you have someone to play when you get started. 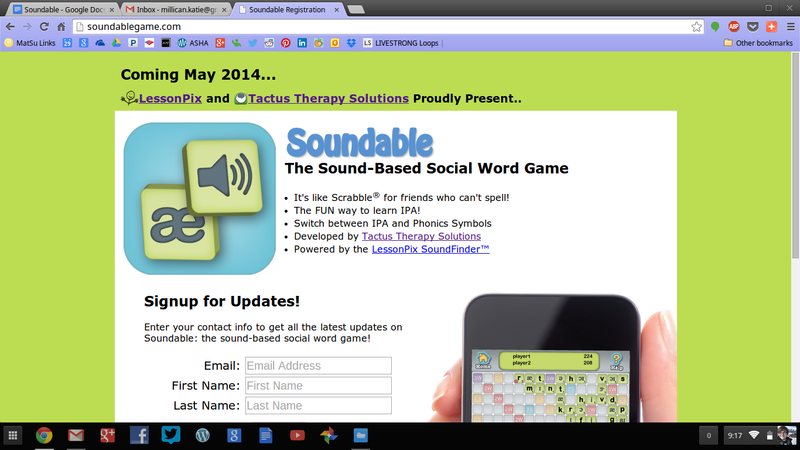 Game Types: You can play a “Quick” or “Full Game” in Soundable. 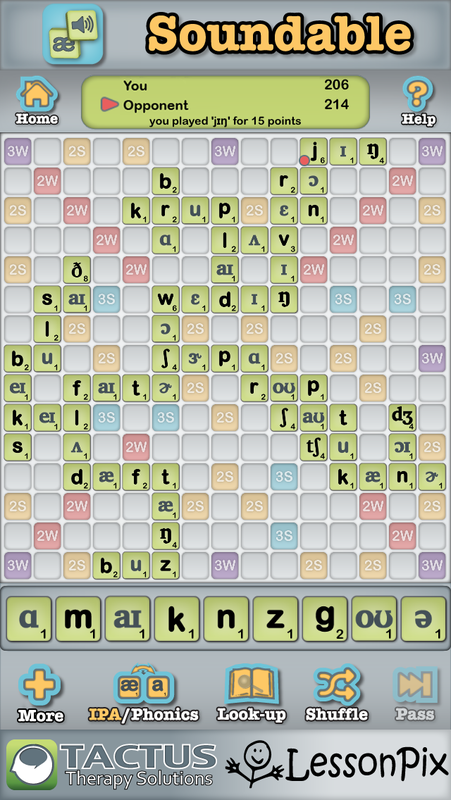 Meaning, you can play your opponent until the last tiles have been laid – OR – you can see who makes it to 200 first. Both have their challenges. In a quick game, you need to focus on getting the most points as quick as you can. In the “Full Game”, by the end, you might only have 1 consonant and like 6 vowels. Yikes! Either way, get ready for a challenge! What Do I like about Soundable? It’s a brain teaser: I think in letters. I didn’t really realize this common fact until I started to play the game. For example, the word “churning” in IPA looks like this → but my brain would look at the board for a “c” I might could play the other sounds I have. “Look Up” Feature: AKA my lifeline in this game. The hardest part for me in this game is distinguishing between vowels. /ɔ/ vs /æ/ vs /a/ trips me up, especially if there’s a nasal phoneme. For instance, the typical “ing” endings of words sounds like there’s a long “e” sound, aka the /i/ IPA symbol; but NAY, the /ɳ/ on the end makes the vowel short so it looks like this -> /ɪɳ/. Life is much easier if you just look up words in this game! Appeal Words: I love that I can play made up words or variations of words if my opponent approves my appeal. For instance, when you say “letter”, the /t/ is actually spoken as a /d/. You can appeal to your friend to approve your finicky transcription. Help Button: If you forget what the IPA symbols mean, there’s a handy Help button in the top, right hand corner where you can scroll through all the different IPA and phonetic sounds with examples of each. This also tells you the place, manner, voicing, and vowel height of each sound – what an epic feature for SLP students #slp2b !! 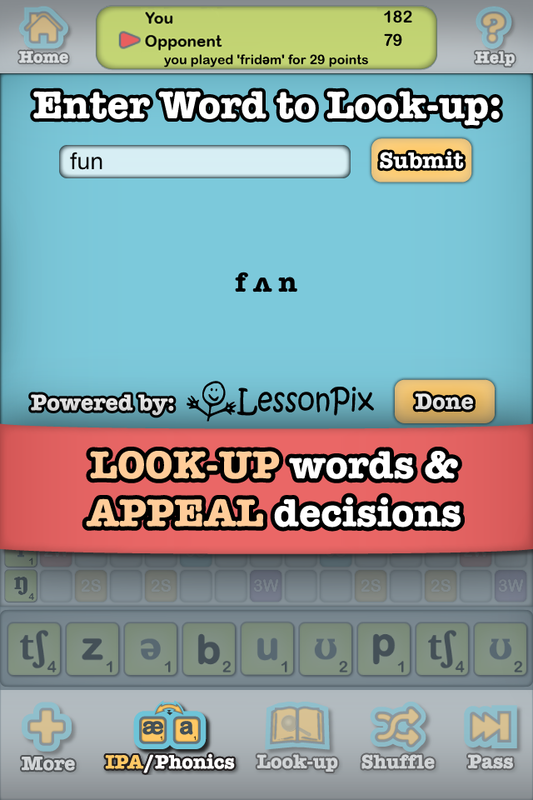 Phonics Mode: If you’re not an SLP or familiar with IPA, you can play in phonics mode. That way, the crazy IPA symbols don’t scare or trick your brain. Let’s be honest, this symbol → ð ← just looks weird. Phonics mode lets you see the phonetic spelling of the sound. So instead of /aʊ/ you see “ow” on the tile. Easy-Peasy! I’d love a ‘cheat’ or ‘tips’ option, even if I had to buy it. It’s hard to think in sounds sometimes. So when you have all those sounds lined up in your tray, I’d love to get like the top 5 suggested plays with what’s on the board and what’s in my tray. Ability to rename my game. Sometimes I can’t remember that my friend whose username is CrayCray22 or whatever is actually Robert. ha!